"Quick action equals quick victory." Profile: Windcharger is the fastest Autobot of them all - for short distances. He can go from 0 to 60 mph in automobile mode in almost no time whatsoever, and that makes him useful in certain situations requiring very fast, very decisive action. His personality is similar: what Windcharger decides he decides immediately. He glances at something and moves, seldom bothering to ask questions. This may be because his attention span isn't particularly long. He becomes instantly enthusiastic and a few hours later loses interest. His impatience often diminishes his usefulness in lengthy, complex courses of action. 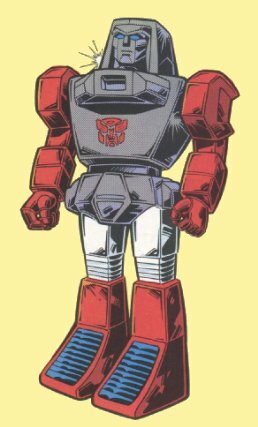 Abilities: In robot mode, Windcharger's arms act as the positive and negative poles of a magnet. He can cast powerful magnetic fields at distances up to 700 feet. He can levitate a 10-ton block of steel at that distance. He can attract objects that are affected by magnetism toward him or repel them. At closer distances he can rip them apart. Weaknesses: If overused, his magnetic ability uses up tremendous amounts of power. Hence, he must be careful in using it. Unfortunately, Windcharger is seldom careful and so is prone to debilitating burn-outs.